Team Rainbow Six Siege have unveiled a first glimpse at the new map coming to the game with the Year Three Season Two update, a picturesque Italian villa in the Tuscan countryside. Here’s everything we know about Year Three Season Two so far. 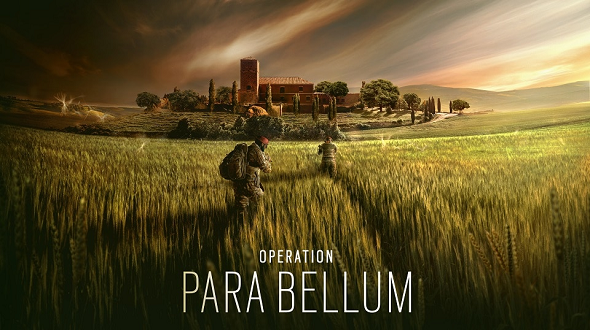 Ubisoft plan to reveal more later this month, but from the teaser shot above we can see two operators making their way through golden wheat fields on their way to the brick villa, situated on a low rise dotted with trees and landscaping. The two operators shown in the shot line up with leaks we’ve covered – they’re sporting the same uniforms and red berets as we’ve seen on Alibi and Maestro so far. Year Three Season Two also brings with it a new intel gadget (most likely this is the Bulletproof Cam), a buff to the Clubhouse Map, a buff to Echo, plus the new pick and ban settings. Ubisoft say they’ll be revealing more during the May 19-20th Pro League Finals, which you’ll be able to watch on the Rainbow Six Twitch channel. We expect the full update to come out in early June.